1 map : col. ; on 26 sheets 65 x 55 cm. Library of Congress copyright "Jun. 16, 1926" stamped on sheet 1. 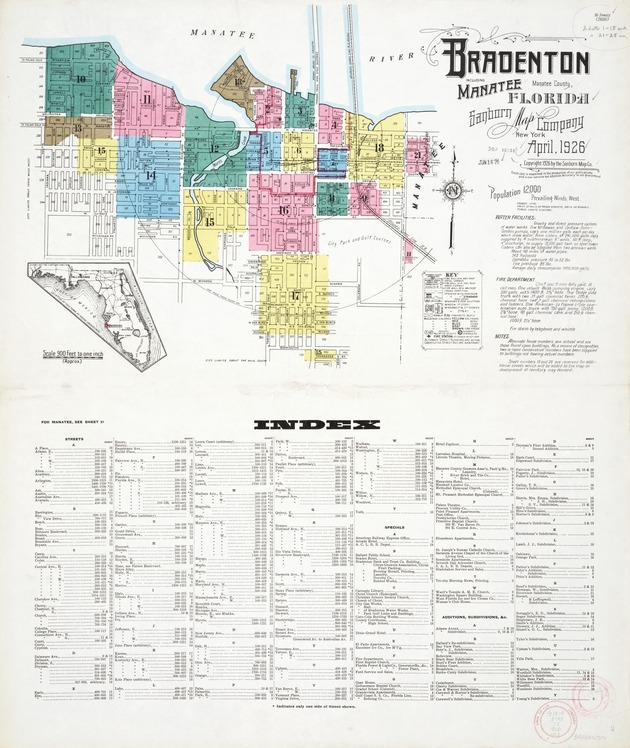 Includes separate street index and sheet index for the town Manatee, Florida. Numbering of sheets irregular: 1-18, 21-28.
r F M'2 E, PARK W "
'\ Copyri ht 6 bythe Sanborn MapeD. Gordon pumps, Ca pv one mi//io galls. each per day. AboUt '16 mries of waterpipes. LDmestuc pressure 45 to 52 lbs. truck with two 35Gall cheml'cal tanks 20/.ft "
to buidi' 7.i not hav/yn9 actual number. developmen- of te/itot-y may demand. F ir . . . . . .. .. . .. . . .. ..
S S ., . . .. ..
C H arlan ...... ...........- ..
Central Ave., E..-----------------100-214 "16 Haze, see Patten Boulevard. ------ ----- -- 101-411 "16 S.,. . . . .
* Indicates only one side of Street shown. 4ZEA++r F+L. +i ____________....._______---__-___"_._"__ ____ __.______"
/-.- 12 oI/l, ,/Z .. .
S. -. .. lW ..
+-'-" 3 1 '-, S -o s OF ; 'II/ / "
V 9++++++ ++ : +I r ... G .FFR M .....F S R AJB : 5FE . 5 : I GI IS I I I . .. .a . .
S .,o +.+,+: , ,::, :, 6. o.
" '" ," "_ -- + C .- '~'t 8 6 y ; 1u u r / 5 ,f ', - the S. ... - -'a, . ..i", .. ..
60 it lo !"n. ,';! o ! E. MANAft" 9LTH@ / AV. Copyr,!ht /926 by U~e Sanborn Map to 9. (9 0 /L F v R sA,9 E Scale of" Feet. WEs7 FLoRIo, IcE IcE gM 0D. Scale 00 Ft. to One Inch. CNu' On TI EL//G 6oa. 16107 1003 /00/ .Y' _____-'"
dL'~s *IL24 802 5 703 "/?. -&90" 8W=7===7? J.07 S- -5 = . 4( % A z "
'Ii I"- -" --9L . I 514 506 4. .420 . Scale 100 Ft. to One Inch. Copyrpt /IMF by the Sanborn Mp Co. Scale 100 Ft to One Inch. Copyrght iM by the Sanborn Mp Co.
[T00o IA9 I__II 1 ! I /Z Z lolvT Co.
:"- (,.2 " E C E N F 4 ..- "A V - "
dIaIe Iu u t. t I L LU .JI Il IIIL,,;. Q: I Full paid chief, 15 call men Equipment consists of Rcmericaco-. La France triple Comb., 750 gal. pump, 0oo' '/e"bose, 50 qal. Manatee Ave---------1958, arb. 28 Centralia Hotel. IW O JIG 0 v ,. = == IJ= t.. .
n a t e e / v 6' AA TEE. - -+"= "= "=='=--'= GRAHAM AV. IC4 309"6 .. 'v'= .,= = ... .
Copyrlfht /-W by the Sanborn Map Co.
140" Copyright /sm by the @onborn Ma/p Co.
TI A4 f/ ? OCK. sj pClg 1 /q*1U";7(m s/F./fr. 1,9.-W TC/IMNN #PPff CLOCK C/fM'S 1,/IS & t'r"'S -Y,5. # YO' & d O $ t S N O T / S /I-3 P P I E D o y w c s W ) R OE 7 5H0 O p 'L F .
5"S/ICT/ON,TOm I Ite I-I',TI Y020,000C Gfl.fELE f y i(. Located 7)//er .of ','n?/ee 00. 100 Ft. to One Inch.